The house dates from 1909. 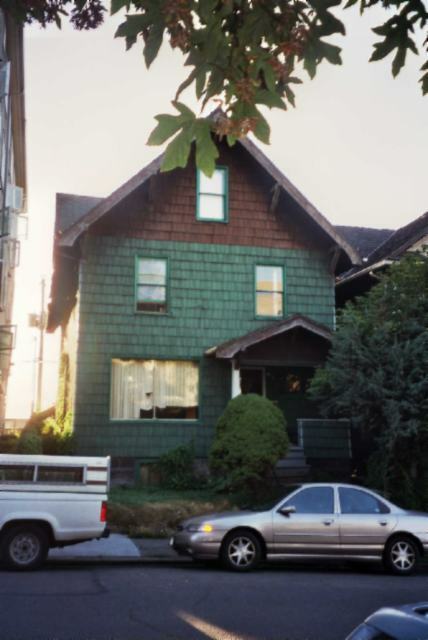 Based on photos from King County Records, the house has been untouched, down to the color change at the attic level, since 1958. Although the design is simple, the detailing of bargeboard and repeated brackets is distinctive. This building is one of the very few remnants of older single family housing in the Cascade neighborhood, in all of South Lake Union area and Downtown Seattle. Rectangular in plan, this house has a simple gable roof and is clad with composition shingles. It is two stories in height with an attic, as well as side dormers. Its main façade is simple: on the street level, a large wide window with a gabled entry porch to the right (north), two symmetrically placed windows on the second level and one window at the center of the façade at the attic level. A distinctive and repeated detail, with Craftsman overtones, is the slightly curved bargeboard end, which is then squared off and the manner in which the bargeboards are cut to fit around the square ends of the repeated brackets. Also distinctive is the change of color, in this case from dark green to brown, at the attic level. Baist, William, Baist’s Real Estate Atlas of Surveys of Seattle, Wash., Philadelphia: W. G. Baist, 1908 &1912, Section 7.